What Minimum Specs Should I Get For This Price? A killer gaming rig capable of running the newest AAA shooters or VR exploration games at high frame rates will usually set you back a pretty penny. If you aren’t willing to spend over a grand on a gaming machine, there are still plenty of options for you to pick up a powerful machine, however. From larger screens with top of the line graphics cards to astonishingly tiny computers with touch screens, there’s no shortage of gaming hardware at this price point. We’ve rounded up seven of the absolute best gaming laptops under $1000 to meet any needs, from cutting edge graphical capabilities to small form factor touch screen models. No matter if you want big or small, sleek or glitzy, or even VR-ready, we’ve got you covered! Whether you prefer Overwatch, We Happy Few, or Monster Hunter World, you can run nearly any game on high to ultra settings with any of these budget laptop picks. For graphics-intensive single player campaigns or online multiplayer fragfests, achieving excellent visuals without any lag or speed drops won’t be an issue. Most of these computers in the $900 – $990 range are also VR-ready and fully capable of utilizing the HTC Vive or Oculus Rift equipment (with only a few exceptions noted below). Don’t care about VR games and want to save yourself some cash by lowering the system specs? Check out our best budget gaming laptops under $800 instead! At this price range you can expect to see dedicated GeForce graphics cards on par with desktop machines, but there can a wide range on the other specs. Radically different options will be available in terms of system RAM, processing power, screen types, and even screen sizes. Picking the perfect laptop will require weighing the pros and cons of many different brands and models. Do you want something with the best specs right out of the box, or would you prefer to save some money and upgrade various internal components later? Is the graphics card most important to you, or do you want more RAM and a newer processor for resource hogging applications? Ready to get started comparing? Let’s dive in and see what’s available for $999 or under! 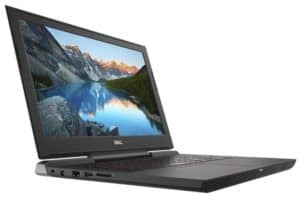 In 2018, the Dell i7577 is the single best overall gaming laptop currently available for less than a grand. You simply won’t find a portable machine with a better graphics card at this price point, so if you need to run the newest games at the highest settings, this should be your pick. Even some pre-built gaming desktops don’t sport as heavy duty a video card as this gaming beast. While it has less system RAM than other models straight out of the box, it is also quite easy to upgrade with extra memory later. Keep an eye on Amazon or Newegg for 16GB RAM sticks to go on sale for the best possible system configuration! Between the secondary solid state drive for quick booting and high end graphics card, the i7577 features better specs than some pre-configured gaming desktops. If graphical performance is your main concern, this laptop should be your pick over absolutely any other. 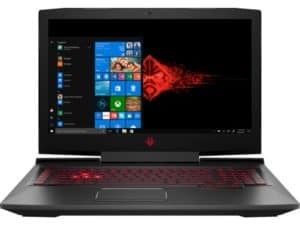 Without question, this is the single best graphics-focused laptop you will find before crossing the thousand dollar threshold. Considering that some desktop machines will run this price just off the graphics options alone, this is a model you should be strongly considering for the best visuals. The 6GB version of the GTX 1060 dedicated graphics card will play anything you can throw at it on high to ultra settings. Whether you are stealing cars in Los Santos, exploring dungeons in Tamriel, or racking up frags after jumping off the battle bus, expect very solid graphical performance here at all times. Although the amount of RAM out of the box isn’t amazing for the price point, upgrades are simple here with only a single screw to remove in order to add in new memory sticks down the line. Buying extra laptop RAM will likely push you over the $1000 budget however, so there’s a major trade off there to consider if price is your main selling point. The screen’s inability to fold back all the way has been a sticking point if you play games while laying on a bed or couch for some buyers, but otherwise they love the fast speeds and built-in fingerprint scanner. The top-of-the-line video card is also a major bonus here that sets this Dell model apart from the competition. 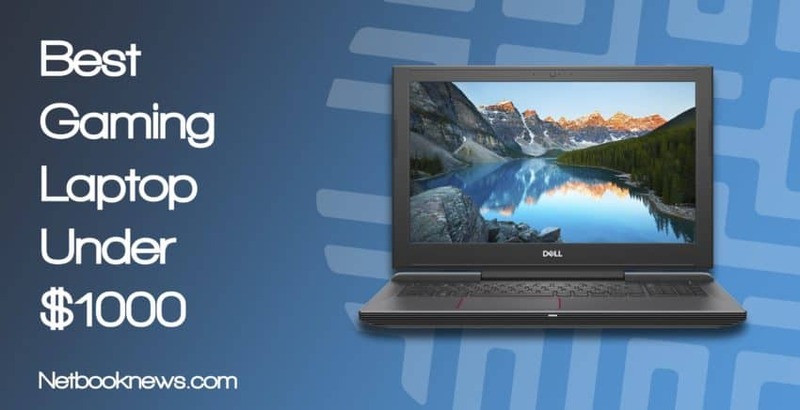 Do you want a laptop that looks awesome, plays great, and has a fairly thin design? If you’ve got the money to spend, the ASUS ROG STRIX should be your pick. Make sure to take it out in public and show off all those killer keyboard colors so you can justify the price! The ROG STRIX is easily the most aesthetically-focused of the affordable gaming laptops, with a multi-colored RGB keyboard that makes it very clear this is a machine meant for gamers and no one else. The ROG line is crafted specifically to appeal to that sense of flash that serious gamers crave. It’s not just pretty colors and a cool design though, as the specs are more than worth the price tag as well. With 16GB of RAM and a GTX 1050 graphics card you’ll be running anything from Gears Of War 4 to Far Cry 5 at higher settings without losing a stable frame rate. With all that system memory and a mid-to-high tier processor, you can also use the STRIX for nearly any work or school application you might need as well, from AutoCAD to video animation. Gaming giant Blizzard picked this nifty little machine as the official sponsor of BlizzCon, so you know it’s going to smoothly run all the best Blizzard titles like Overwatch and Diablo III. Keep in mind that the base model comes with the Chrome OS. If you prefer Windows 10 and want a bit more hard drive space, the next model up is only an extra $50 and includes an extra SSD for faster booting. That will put you over the $1000 range but can be worth the cost if you only know the Windows layout. The high heat output and low battery life are often cited by buyers as the main negatives of the ROG Strix. The RGB lighting, extremely fast speeds, and ROG Gaming Center app for better control over programs are the primary positives on the other hand. 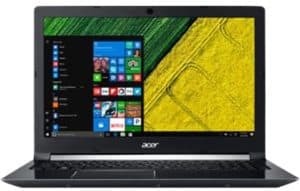 At well under $1000 and with great gaming specs, the Aspire 7 should be your pick if you want a laptop that gets the job done without the flashiness of RGB lighting or gaudy angular designs. If you need something that could just as easily be taken to work as the internet cafe, then look no further. This is a laptop that fits in as well at the boardroom full of stuffy suits as it does as the eSports arena filled with screaming FPS gamers. For those who don’t need a rig that screams “I’m a gamer!” with a bunch of flashing lights and etched designs, Acer has one of the best budget gaming laptops around at under a thousand dollars. The upgraded Ti version of the graphics card will handle most gaming functions, while the 8th gen processor will be able to smoothly run any applications you need. This is an excellent well-rounded pick for anything from video editing to playing MMOs all weekend long. If you can’t be bothered to remember passwords or have some security concerns about your laptop, the fingerprint scanner is a nifty addition at this price point for easy sign ins without having to type anything. 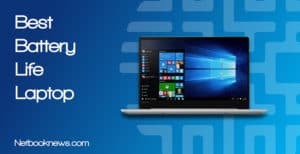 Most buyers cited the key features of the Aspire 7 as the quiet solid state drive for fast boot times, as well as the understated blue backlighting on the aluminum-style keyboard. 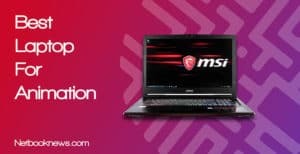 If black and red lit laptops get your heart beating faster, your gaming laptop search should start and stop with the MSI GL62M 7REX. While you will need to keep it plugged in often, the specs are top notch and the aesthetics are eye-popping. 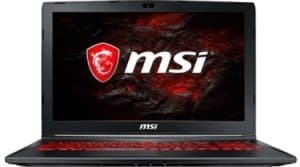 While you can find lighter machines than this (such as some of the 13 inch laptops listed below) the MSI GL62M is easily one of the best lightweight laptops in terms of overall gaming specs right now. At just over 5 pounds, you still get a whole lot of power, from the 4GB version of the GTX 1050 Ti graphics card to a suitable high end processor that takes care of business for work or play. The MSI SteelSeries machines are known for their eye-catching designs and that’s exactly what you get here. The rounded, red backlit keys are quite the sight, and they also feature anti-ghosting technology for smoother gaming. When a single keystroke is the difference between a kill shot and getting fragged, that can be a huge game changer. If you often bind your own specific keys for online games instead of using the defaults, keep an eye out for laptop keyboards with that feature. Buyers who reviewed this MSI model frequently note that the black matte finish needs to be cleaned more often than other kinds of plastic, so have some screen wipes handy. 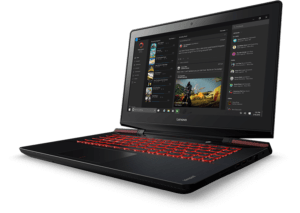 They also mention that the battery life is quite short, but otherwise are impressed both by the style and speed of this gaming laptop. Don’t mind waiting around awhile for a sale? Then this should be your pick, because its specs are absolutely top notch. In terms of system specs, you won’t find much that’s better than the HP Omen with a top tier processor, more RAM than many other models, and a solid graphics card. The dragon red backlighting is also a big plus for gamers. There is a downside, however — the price often jumps up and down on this one from $999 to $1,099. You need to keep a close eye on it for the best deal if you don’t want to spend above a thousand. After extended play sessions, buyers mentioned the overall quiet fans and high specs as the laptop’s most positive aspects. While they liked the dragon red backlighting, some buyers were disappointed that the only options are either all-backlit or WASD backlit. Unlike other models, there’s no ability to change the key lighting to other options. If you want a larger screen size and need something for both school and gaming, then the Lenovo IdeaPad should be your pick. 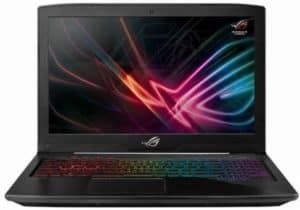 You won’t often find 17 inch screen laptops with these higher end specs suitable for a gaming at a lower price, even when shopping sales or clearance. For casual gamers, Lenovo’s IdeaPad Y700 offers a well-rounded solution for both gaming and school or work projects. With 16GB of RAM out of the box and a spacious SSD, you will get excellent speed and performance whether running work applications or raiding in World Of Warcraft on a Friday night. The graphics card just misses the minimum specs for VR setups like the HTC Vive, however. If you aren’t interested in VR gaming, though, then you can’t go wrong here at well under the $1000 price point. Users often mention the machine’s loud fans as being somewhat distracting, so keep that in mind if you tend to game late at night near sleeping family. Reviewers were otherwise impressed by the good speaker quality and ability to game casually with solid frame rates. 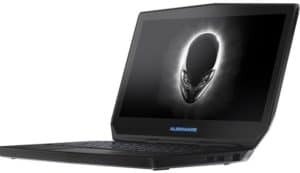 If you prefer a smaller overall size but still want decent gaming specs, the Alienware ANW13 should be your pick. When a smaller size is more important than the latest graphics card for playing on ultra, this is an excellent compromise machine. While most Alienware systems will run you well over a grand, the gaming-focused brand does have some more budget-friendly options. More than just a stripped down version of beefier rigs, the ANW13 offers you a suite of features you can’t get with more powerful laptops. Here you combine extreme light weight, a smaller size for easier carrying, and a full touch screen into one tiny but powerful package. Splitting the difference between a tablet and a full fledged gaming computer, you can take the ANW13 just about anywhere and still play newer games at decent settings. The SSD means you get great boot times, but you may want to consider investing in external storage, since this slim laptop only has 512GB of space, which is a concession that must be made to get such a small machine. Reviews across the web often mention the model’s responsive touch screen, smaller form factor for excellent portability, and sturdy, backlit keyboard. If your main deciding factor on a laptop is picking the lightest, thinnest option for easy carrying, then this absolutely should be your choice. You won’t get a top of the line gaming experience like with the other contenders for best laptop under a grand, but you can’t beat the low weight and handheld nature of this model. Unless you are buying a tablet, you just simply won’t find a gaming device that weighs less than the ZenBook. You could seriously buy a handheld gaming console that might weigh more. Asus sort of redefines what is meant by “gaming on the go” with this laptop that weighs well under 3 pounds and comes in under $1000 with respectable gaming specs. In order to reach that ultra thin design with the incredibly small weight, of course there are trade offs on the hardware to keep in mind. With only 8GB of RAM and a lower end graphics card, you can expect frame rate dips on newer games. This will be especially true when playing team-based Battle Royale games with dozens of players on the screen at the same time. You may also notice lag on graphics-focused shooters when going above medium settings. 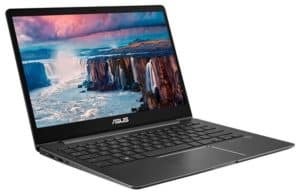 Buyers constantly mention the responsive trackpad and unbelievably light design of the ZenBook 13 when reviewing their purchase. If you are looking for a machine that can handle more than just casual gaming, the dedicated graphics card and processor speed should be your primary areas of concern. Before crossing a thousand dollars you can squeeze a whole lot of power out of a laptop and find a very high end machine. If you are going to spend more than $900 on a computer, you shouldn’t be willing to go below the GTX 1050 Ti on the graphics card front in most cases. The only possible exceptions here are when you are specifically looking for something in a smaller form factor that is easier to transport. For the best loading and install speeds, be on the lookout for a 7th or 8th gen processor in the 7000 to 8000 model range. While you can save money by going below those options, you won’t get nearly as smooth a gaming experience. In order to hit that sub-$1000 price point, you may still need to make a few concessions on other specs, however, such as starting with 8GB of RAM instead of 16. Most games will still run at acceptable speeds with only 8, but you may notice frame rate drops at the higher settings. The portable nature of a laptop means you can game wherever you happen to be traveling, but there are some pitfalls that come with lightweight designs. 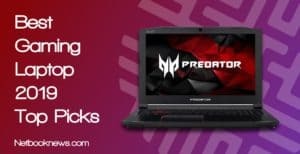 For gamers specifically, there are several potential problems to know about ahead of time when buying a laptop that may not be immediately apparent. Higher end gaming laptops with more powerful graphics cards can run quite hot. Beyond just being uncomfortable to hold on your lap, that can lead to reduced life span as the machine burns out. This is one case where spending more money can actually result in a bigger problem with higher end specs. Those marathon Fortnite sessions where the time just flies by can end up drastically increasing your hardware’s temperature. To avoid this problem, you should strongly consider investing in a cooling pad with additional external fans if you plan on gaming for long stretches of time. Many gaming laptops also throttle their overall performance when relying solely on battery power. It’s a bit of a paradox, but this makes them less useful for graphics-intensive games when you are away from an outlet, which is sort of the whole point of a laptop to begin with. For much better overall performance on any type of game, always try to play when plugged into the wall. This may negate the advantage of portability, but the trade off is worth the trouble for a brighter screen and faster speeds. Even when spending well under $1000 you can still get an absolute beast of a gaming rig that will easily play the latest games on ultra settings without slowing down. The pace of technology never stops though, and what’s cutting edge today will be obsolete tomorrow. To keep pace with the requirements of any newer games coming out, always be on the lookout for a laptop that has easily accessible RAM ports for simple upgrades. Some laptops keeps this extremely simple, with a single screw on the bottom side opening up directly to the RAM slots. Others are far more complicated, requiring you to pull off the keyboard and remove several layers of parts first. Keep in mind the number of total slots available, as well as the maximum amount of RAM the motherboard can handle. Some machines split their RAM between two sticks, while others only use a single stick. Upgrading the Dell i7577 to 32GB of RAM for instance puts it on par with some of the best desktop gaming rigs out there if you can budget for buying extra memory. We hope you found a portable gaming rig that will perfectly meet your needs in our roundup of the best gaming laptops under $1,000! Whether you need a VR-capable desktop replacement or something extremely light and easy to carry, there should be a machine here that meets your needs. Which of these sub-$1,000 laptops did you like best, and are you planning on ordering any of them? Let us know in the comments section!